Standard model at 4 ton capacity. Separate model with Spider Arm design for 4 ton capacity. Plunger finish – Hard chrome plated to 20 microns. Heavy duty rigid ramps accommodate a wide range of vehicles of varying size and type. No. of posts 1 No. 1 No. 1 No. Oil fill capacity 150 Ltrs. 150 Ltrs. 175 Ltrs. 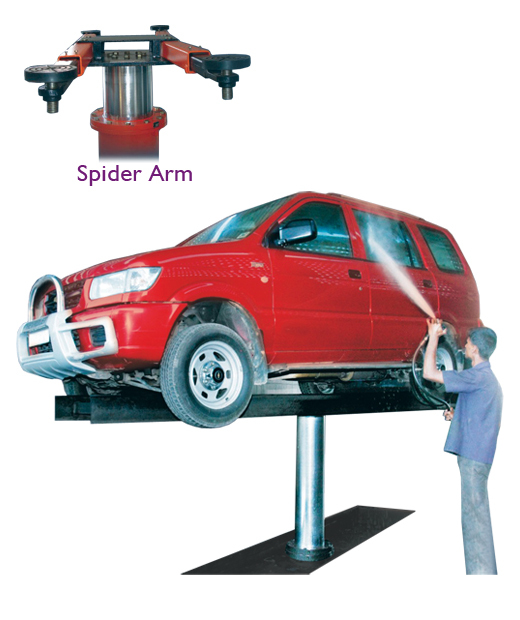 HYDRAULIC WASHING LIFTS – English.